Chace 5-pc. Dining Set This Chace 5-piece dining set will feel right at home in your contemporary or transitional dining room. Plus, the table's self-storing butterfly leaf is so convenient, especially when you entertain! And how about those gorgeous, reverse-diamond veneer patterns on the tabletop and the chairs' ladder-back design and textured, blended seats? They're perfect examples of this dining set's exquisite detail and fine craftsmanship. This Chace 5-piece dining set will feel right at home in your contemporary or transitional dining room. Plus, the table's self-storing butterfly leaf is so convenient, especially when you entertain! And how about those gorgeous, reverse-diamond veneer patterns on the tabletop and the chairs' ladder-back design and textured, blended seats? They're perfect examples of this dining set's exquisite detail and fine craftsmanship. 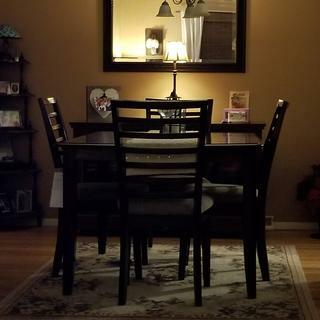 L: 60" x W: 40" x H: 30"
L: 22.5" x W: 19.5" x H: 38"
I purchased this dining room set on Feb., 2013. Dining room table is nice, quality not great. Chairs legs screws are always loose where as I have to hand screw the screws or use my screwdriver to tighten all screws. Today, April 7, 2015, I contacted the Platinum Protection Plan I purchased. I explain to Protection Plan that my table chairs are always loose. Protection plan covers the loose screws on the chairs. If the chairs continues to have loose screws, I have no other choice but to buy news chairs to match my table. I did initially love this set but after about a year or so. The screws kept getting loose on both the chair and table. I did have younger children who would push the chair when getting up. They didn't understand the concept of standing up before pushing the chair back. So, I'm figuring this is why the screws always loosen. As far as the table, I have no clue why this happen... If you have small children or there will be minimal usage I'd say give it a try. Otherwise stir away from this piece. I've owed this product for close to 4 years now and I can say that I'm very happy with this purchase. We use it for our everyday dining, the kids do their homework on it..etc...it gets plenty of use and I have to say that it's held up wonderfully, the table has a few nicks but nothing that a furniture pen doesn't hide. It still has it's showroom shine and is very easy to clean. The only downside is the chairs...I feel that they weren't constructed as well as the table. We have loose legs on about 3 of the chairs..it could be because my husband whose over 230lbs tends to plop himself on the chair...I don't know...but other than that I think it's great! The best part of the Dining set is the self-storing butterfly leaf with which you can modify the table to fit anywhere. Also the colour of the set is awesome which gives a rich look. This is my dining room set. I absolutely love it. The wood is beautiful and the color is perfect. I only buy furniture at Raymour and it is because their pieces are strong, reliable and absolutely fabulous. You should get this! I just received the 5 piece set and the china curio. The pieces are beautiful, although it took some time and effort to get tape marks off of the curio glass. The tape was taken off by the delivery guys, but the residue from it was very difficult to remove. We use this dining room set not just for special occasions but for casual get togethers as well. Comfortable seating to work on projects, homework, etc. We get a lot of complements on the style and color. Everything is wonderful! The wood, the chairs, everything just lines up and was the missing link my dining room needed. I recently bought a home and have never had a dining room before, thus the need for a dining room set was urgent. I bought this set, along with two extra chairs, and a matching china cabinet, and could not be happier with my purchase. Thank you R&F!!! I purchased this set in 2008 and it is as nice as the day it was delivered. It is sturdy, nothing has to be adjusted and I love the butterfly leaf. Only the tabletop moves when the table is extended. You can't go wrong with Raymour & Flanigan. buyer Beware..buy the protection plan!! Purchased Chace 5 pc set..app. 1 1/2 yrs ago. As it "looked like a true wood surface and having read the reviews, we opted out of the protection plan..BIG MISTAKE! Overall the look is nice...BUT, you cannot put any serving bowl, platter, etc that has warm food on it without it leaving marks, whiteish rings that WILL NOT "buff" out.It shows scratches like crazy. I contacted the customer service although it was over the years' purchase..and they would not support it in any way. They actually told us to come in and they would "work out something"..which turned into they would "nicely" give us 10% off a NEW set..well, what should we then do with the original. This was the best purchase for this year. Just in time for the holiday with a lot of family member. The look great in my dining room. I love my Dining Set, I am sitting at the Table right now . I love the Quality of all of my Furniture I have purchased from Raymour & Flanigan. I bought the dining set and I am satisfied with it. The Chace 5-pc Dining Set fulfilled my expectations. I love the color, the texture of the wood and most of all the durability of the furniture. The chairs are comfortable with cushions not too firm nor too soft. I ordered the table with four chairs but have the option of adding more chairs to my set since the table can be extended. I must say I was a little nervous ordering such large items online. I love my new Dining Set. The salesman as helpful with the style I wanted. The delivery men were very courteous. Workman ship is excellent.. Wood is of high Quality..Chairs are sturdy & comfortable.. The is a beautiful contemporary set. It's just the right size for our dining room. We put the light on in the China cabinet in the evenings for a nice ambiance. I think this set is excellent, especially considering the price. It's sturdy, elegant, and great for both formal and informal occasions. I have a 10ft wide area for my dining room (or dining partition) and I was worried this table would not fit. It fits well! In fact, it even fits with the leaf open. Speaking of the leaf, that is such a neat feature to have the built-in leaf. I don't think it's a pain to have a separate leaf, but it's neat to open the table (which only the top moves, not the legs, in a neat little surprise twist) and watch the leaf unfold. I was worried it wouldn't be sturdy, but it is. Sometimes the chairs in the showroom are a bit loose and fragile, but these seem strong and well put together. Also, the chairs are quite comfortable. They are hard at first, but they're slowly getting softer. I think a table like this is ideal for many. I think it should come in different colors and designs. I've only had it a few days, so I can't account for any long-term issues, but so far, this has been an excellent piece. to the delivery &set-up of this furniture. This dining room set is used every day as we don't have an eat in kitchen. It is comfortable and looks rich but at a very affordable price. we love the table and chairs. it is the right size .the finish and color is just beautiful. Looks great in the room. Subdued but beautiful and serviceable. Just perfect. I absolutely love this table. The look of it alone is worth the cost! It is extremely unique, the perfect size and well-made. I use this in my dining room and can't wait to have more guests to use the butterfly leaf. I've owned the table for 9 months and haven't had a single issue. If you like the way this looks, you must buy it! Trust me, you'll love it. We did some 'shopping around' and found exactly what we were looking for at Raymour & Flanigan! And we purchased at a great sale price! The wood grain is lovely and the furniture is solid and comfortable. Really happy with our new dining set. I been looking for a small table with leaf inside. I was so surprise to find it at Raymor and Flanigans. The chairs, with cushions,are also exactly what I was looking for. They are very comfortable. Your staff was very helpful and polite. I would recommend your store to anyone who asked. This is the third piece we've purchased over the last six months for our new apartment. Each one has been of good quality and the sales service (Richard Einhorn) has been excellent. Also, delivery and setup has been superb. I use this set for everyday dining. It is attractive, sturdy and comfortable. Exactly what our family of 4 needed! We have a very small kitchen...no dining room...and 4 members. Daddy, Mama, and two growing boys! This table is exactly what we needed to satisfy our family in the small space that we have. We often have company for dinner whether it be Nana and Papa or the neighbor kids so the self storing leaf is AMAZING! Another thing to note is that the LEGS of the table do not move when you are expanding the tops for the leaf...a LIFE SAVER on our new wood floors! The table top seems durable and family friendly thus far. The toddler dropping silverware and slamming sups down on it CONSTANTLY haven't seemed to cause any harm. The color and pattern on the table is beautiful and it does not have any gouges or "distress" marks that seem to be so popular with these modern pieces. 1. The chairs have extra little feet on them that cause our felt pads to keep coming off. 2. After our first dinner gathering...I kind of wish it had an 18 inch leaf versus a 12 inch!! All in all??? LOVE IT! Hi Andrew, we are so happy the Chace dining set is working out for you and your family. Thank you for your review. LOVE MY NE DINING ROOM SET! LOVE IT!! the weight and comfort of the chairs is wonderful. I certainly recommend this piece!!!! Got the set one week ego. Looks nice, elegant and solid at the same time. Hope in a year I will add ‘durable and robust’. I love this set!! This is my everyday table and chairs. Gets lots of use with four grandchildren almost every day. Love the built in leaf. Don't have to worry about where to hide it when not using it. Beautiful finish goes with my modern/traditional style. Seats are fabric but haven't had any problem cleaning off drips and drops etc. I have the matching buffet which compliments it beautifully. Only drawback I see is that the finish on the chair back chips easily where it meets the table when pushed in. I repair this easily with a stain pencil. We got this to replace our old, dated table and chairs. The chairs are surprisingly comfortable. And we were pleasantly surprised at the leaf and how it stores in the table. So far we are very pleased. The Chance Dining Set looks beautiful in my new condo. I was looking for set that was not bulky, had clean lines, and was good quality. The butterfly leaf is great. Now I don’t have to store a leaf in a closet! Its looks great, I think I will get two more dining chairs too. I would recommend it! We bought this set originally for our apartment. It it beautiful and has comfy chairs. We bought two more chairs for when we put the leaf in the table. Now we have it in a formal dining room in our house. I keep a table cloth on it because the table doesn't look as formal by itself. Love the chairs though and the color! The color, and the design on the table is good. The server has a simple design but neat. Got additional two chairs.|The chair could have been more comfortable to sit. I love the color and the chairs are more comfortable than expected. I love it, and I give it a 4 stars because I felt it should have 6 chairs instead of 4. Overall it’s beautiful. We are very pleased with our dining set. The price was fair. Our only suggestion is that while there are plastic coasters on the bottom of each chair and table leg, they would be improved with felt padding to avoid scratches on wooden floors. I recently moved my mom out to CA from NY. We had purchased furniture from R &amp; F in the past and were happy to see they offered nationwide delivery at a reasonable price. We ordered online and the items were exactly as they were described. They had said the lead-time would be about 3 weeks and this was perfectly consistent with reality. The gentlemen that delivered were kind and setup everything. I would easily refer R &amp; F to anyone. I love the table and chairs, but my favorite part is the butterfly leaf. It saves the trouble of finding stoage for the leaf when you are not using it, and allows the table to be made smaller, easily, which gives the dining room more space. The chairs are comfy and sturdy. 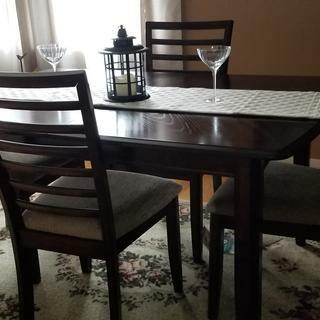 Unfortunately, during hurricane Sandy, we lost our dining room set, but look forward to saving to purchase this set again when we are able to start our lives over again! Where can I purchase the furniture pen for this set? BEST ANSWER: This would be an issue best handled by our Customer Care Center. Please contact our Customer Care Center at 866-383-4484 option 2.
how does the top get cleaned? does it need furniture polish or can it be wiped with a damp cloth? The features mention all the possible wood that can be used in making a piece of furniture - "Kiln-dried hardwoods, furniture-grade fiberboard, particleboard, plywood and ash veneers" ... I understand legs always use hardwood. Is that the extent of the use of hardwood. Is Tabletop a full veneer? What material is the chair back rest and what is the rest of the body made out of? BEST ANSWER: The table top is a full veneer. The chair back rest is made from bendwood and the rest of the body is made with rubber wood. Where can you purchase the furniture pen for this table? BEST ANSWER: A furniture pen would be used with your own discretion, and would be purchased at your local hardware or home improvement store. Do you have pricing for a 5 piece Chasedining set with the drop leaf table? BEST ANSWER: We would be more than happy to discuss pricing with you over the phone. Please contact the online sales department at 866-383-4484 option 3. BEST ANSWER: Yes, each leg can be removed by loosening the two nuts from the two screws attached to each leg. what color is the wood finish? BEST ANSWER: The wood finish is dark espresso brown. BEST ANSWER: The Chase is made by Bellanest, a Raymour & Flanigan exclusive brand. Is the leaf to the table included with the price? BEST ANSWER: Yes. This is a drop leaf table, and the leaves are attached to the table at each end. Yes, but HOW? I just bought this table and it will not open. Do I have to remove the bar under the table ? Or should it just slide open ?